Laminate offers beautiful looks that emulate the elegance of porcelain tile and the warmth of hardwood, but with the easy maintenance and super durability of a laminate. Mannington has the most complete line of wood and tile designs that you’ll find anywhere. And thanks to our proprietary technologies that produce precise embossing and texturing, it’s like you’re getting flooring in High Def. Laminate flooring is one of the most durable and environmentally friendly floors you can buy. And Mannington laminate offers all that…and more. Made from over 70% recycled content, using low-VOC inks and adhesives, Mannington laminate is the only laminate floor certified to FloorScore, ensuring good indoor air quality for your home. Our laminate collection has won more awards for styling and performance than any other…over two dozen in the past five years! Demand the NALFA Certification Seal. Or roll the dice on quality. You decide. We say choose the laminate flooring that is rigorously tested, proven by a third-party facility and guaranteed to be of the highest quality. But we don’t expect you to take our word for it. That’s why we have the North American Laminate Flooring Association (NALFA) Certification Seal. The Certification Seal proves that our floors passed 10 very demanding performance tests. In addition, our floors comply with all CARB (California Air Resource Board) requirements. 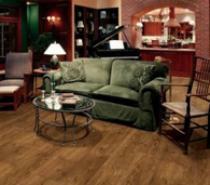 We offer the industry’s best quality laminate flooring available. Not because we say so, but because the NALFA Certification Seal proves it. 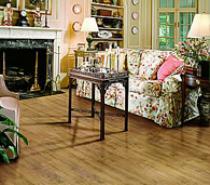 Mannington Laminate Flooring is best known for its durability. It’s practically indestructible, and is a snap to keep clean. And as for style, it also uses advanced technology to achieve realistic wood and tile looks and textures that install by just ‘clicking’ together. The wood looks are even more realistic now that they come in single planks, with texturing and beveled edges – just like real wood. Mannington Laminate is the best of both worlds: award-winning designs, and great performance. And its environmentally friendly, too, with over 70% recycled content and a simple glueless “click” installation method. Click on a product below to find out more about it.